Congratulations to Tiffany Joh (left), your 2009 Duramed Futures Tour Q-School champion. And to runner-up Danielle Mills (below) - Joh and Mills finished five and four strokes clear of the field, respectively. Only the top 20 to 30 finishers received exempt status on the Futures Tour for 2010; as many as 275 players will get status of some level, but the exact numbers (and each player's status level) aren't determined until after LPGA Q-School finals next month. The Top 20 should feel pretty good, however, and Joh and Mills are obviously exempt. Joh is playing in those LPGA Q-School finals next month, however, and if things go well there will be moving up to the big tour. The effervescent Joh is destined for stardom - or at least minor celebrity - even if she never wins a tournament as a professional (but we'd put good money on her winning). Just check out her blog to get a sense of her ... um ... interesting take on life. Click on Tiffany's label at the bottom of this post (below the timestamp) to read more about her on Golf Babes. The Quebecois Mills turned pro earlier this year and got into three Futures Tour tournaments, finishing 18th in one of them. She played collegiately at Elon University, where she won one tournament. 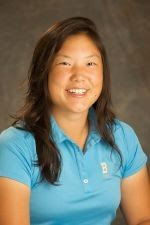 She also won the 2007 Quebec Women's Match Play Provincial Championship. Check out the 2009 Futures Tour Q-School scores to see some more of the golfers we'll be seeing more of in 2010.